You may want to discuss with your students the different types of adaptations that the different desert plants shown here demonstrate. The cactus lacks leaves to avoid water loss, and its light-colored spines help reflect sunlight and prevent overheating; the creosote bush has tiny leaves that can be dropped during droughts (also to prevent water loss) and regrown soon after rains; and the Joshua Trees have thick succulent leaves to help store water. In addition, these plants can have very long lives, with some Joshua Trees living over 300 years, and some creosote bushes living for thousands of years. 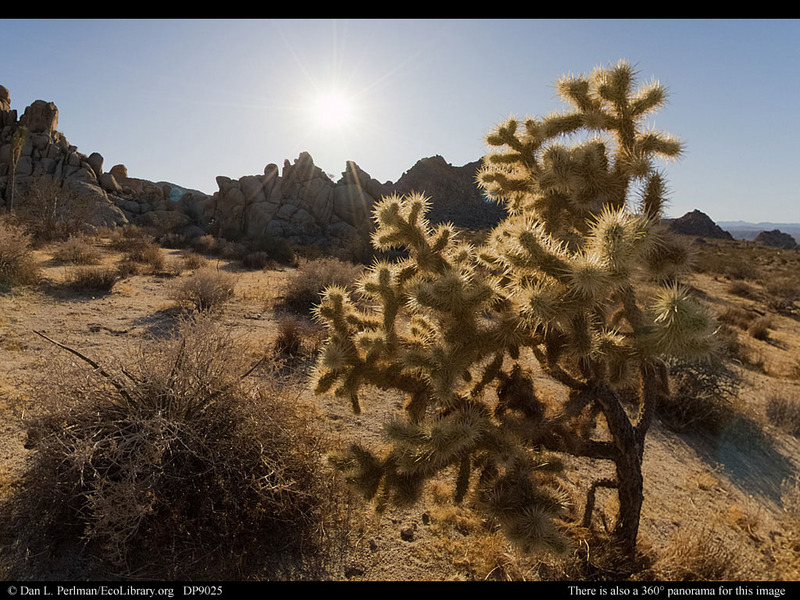 This scene contains several species that are typical of the Mojave Desert: the branched cactus in the foreground is a silver cholla, and the spreading yellowish-green shrub to the right of the cactus is a creosote bush. Further in the distance are several spiky-topped Joshua Trees, which are endemic to the Mojave.